Yes, Facebook is losing teens. As far as GlobalWebIndex is concerned, the biggest news from Facebook’s Q3 earnings call last week was a statement by Facebook’s CFO, David Ebersam, where he said engagement among teens was declining, and Facebook itself is having a hard time measuring the decline. Here is an excerpt of his comments: “this is a hard issue for us to measure … we’ve developed other analytic methods. … our best announcement on youth usage [is that] among U.S. teens was stable overall from Q2 to Q3 but we did see a decrease in daily users partly among younger teens.” He also added that the decline was of “questionable significance”. Firstly, it is important to understand how GlobalWebIndex defines active usage: users must have an account on Facebook as well as have “used or contributed to Facebook in the past month on any device.” This is a simple measure of active engagement that works very well in market research, something that is near impossible to track using passive data collection or analytics due to the issues with auto-logins, multiple devices and ghost accounts (an issue we explored in an earlier post). In short, it is easy for analytics to record users as active despite no actual human activity. Also, Facebook uses a very broad definition of “active” which includes signing in with a Facebook login on a third party site or clicking a “Like” button. These would likely not be recognised by a user as being active. For these reasons, we believe our market research approach provides the most accurate measure. Moving back to the issue at hand, Chart 1 below tracks Facebook active usage among 16-19 year olds in the US vs. Global (our research covers 16-65 year olds in 32 countries) since Q2 2012. What this clearly demonstrates is that just 56% of US teens claim to be active on Facebook in Q3 2013, down 35% from Q1 2013 (76%). This is a substantial decline but also one that is mirrored globally (excluding China). So the answer to this is categorically yes. 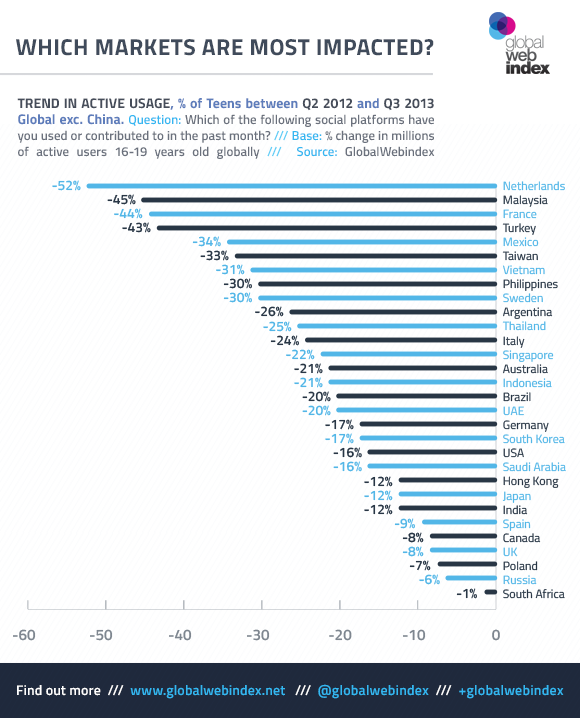 Facebook is losing teens all over the world from its peak in Q4 2012. 2. 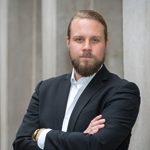 “Is Facebook close to ‘penetrated in the US’ amongst teens – as claimed by David Ebersam”? 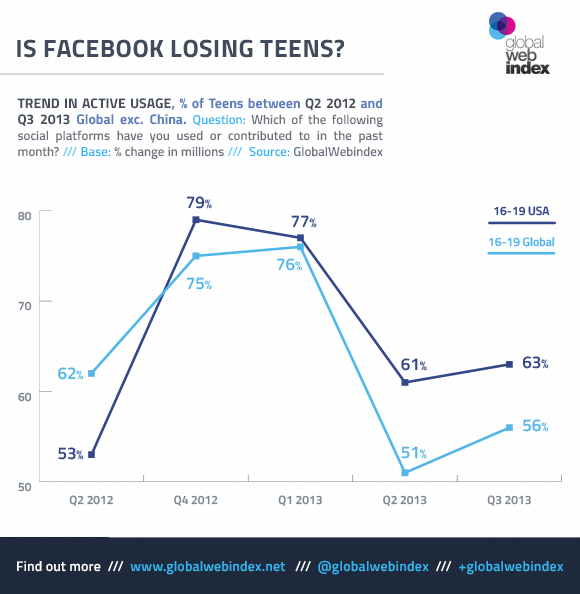 GlobalWebIndex data shows that 89% of US teens and 88% of teens globally (excl. China) have an account on Facebook. This, one could argue, is near penetration. 3. Is the Facebook teen decline only a US phenomenon? David Ebersam also alluded to the fact that this is only a US phenomenon. Chart 1 above shows that actually the global figures are similar. If we segment (chart 2 below) this by market, we get a clear context and can see that decline across 2013 amongst teens is much larger in other markets. The lowest levels of decline are in South Africa, Poland and Russia where adoption of Facebook has been a more recent phenomenon. However, some markets show substantially higher levels of decline, led by the Netherlands which has seen active user numbers fall by 52% y-o-y in Q2 2013. The Dutch are followed by Malaysia (-45%), France (-44%), Turkey (-43%) and Mexico (-35%), demonstrating that Facebook teen decline, global and happening on all continents. The key question we are asking internally is whether this slump is driven by seasonality in Facebook usage or is, in fact, a genuine slide in user numbers. What is clear is that competition from other social media platforms is increasing, and as we can see users are adopting supplementary services that serve specific needs rather than switching to other platforms entirely. Mobile is a key driver of this change where built-in OS functions and applications make it very easy to use many different services, all of which focus on doing very specific tasks e.g Snapchat or Whatsapp. Moving forward, we are tackling these questions in two ways. Firstly, the Stream Analyst team is investigating where teens are going if not to Facebook. Secondly, we are releasing the next wave of our Q4 data at the end of December 2013, which will enable us to better address the seasonality question.